Shri Lal Bahadur Shastri was born on October 2, 1904 at Mughalsarai, a small railway town seven miles from Varanasi in Uttar Pradesh. His father was a school teacher who died when Lal Bahadur Shastri was only a year and half old. His mother, still in her twenties, took her three children to her father's house and settled down there. Lal Bahadur's small town schooling was not remarkable in any way but he had a happy enough childhood despite the poverty that dogged him. He was sent to live with an uncle in Varanasi so that he could go to high school. Nanhe, or 'little one' as he was called at home, walked many miles to school without shoes, even when the streets burned in the summer's heat. As he grew up, Lal Bahadur Shastri became more and more interested in the country's struggle for freedom from foreign yoke. He was greatly impressed by Mahatma Gandhi's denunciation of Indian Princes for their support of British rule in India. Lal Bahadur Sashtri was only eleven at the time, but the process that was end day to catapult him to the national stage had already begun in his mind. 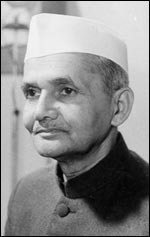 Lal Bahadur Shastri was sixteen when Gandhiji called upon his countrymen to join the Non-Cooperation Movement. He decided at once to give up his studies in response to the Mahatma's call. The decision shattered his mother's hopes. The family could not dissuade him from what they thought was a disastrous course of action. But Lal Bahadur had made up his mind. All those who were close to him knew that he would never change his mind once it was made up, for behind his soft exterior was the firmness of a rock. Lal Bahadur Shastri joined the Kashi Vidya Peeth in Varanasi, one of the many national institutions set up in defiance of the British rule. There, he came under the influence of the greatest intellectuals, and nationalists of the country. 'Shastri' was the bachelor's degree awarded to him by the Vidya Peeth but has stuck in the minds of the people as part of his name. When the Congress came to power after Independence, the sterling worth of the apparently meek and unassuming Lal Bahadur Shastri had already been recognised by the leader of the national struggle. When the Congress Government was formed in 1946, this 'little dynamo of a man' was called upon to play a constructive role in the governance of the country. He was appointed Parliamentary Secretary in his home State of Uttar Pradesh and soon rose to the position of Home Minister. His capacity for hard work and his efficiency became a byeword in Uttar Pradesh. He moved to New Delhi in 1951 and held several portfolios in the Union Cabinet - Minister for Railways; Minister for Transport and Communications; Minister for Commerce and Industry; Home Minister; and during Nehru's illness Minister without portfolio. He was growing in stature constantly. He resigned his post as Minister for Railways because he felt responsible for a railway accident in which many lives were lost. The unprecedented gesture was greatly appreciated by Parliament and the country. The then Prime Minister, Pt. Nehru, speaking in Parliament on the incident, extolled Lal Bahadur Shastri's integrity and high ideals. He said he was accepting the resignation because it would set an example in constitutional propriety and not because Lal Bahadur Shastri was in any way responsible for what had happened. Replying to the long debate on the Railway accident, Lal Bahadur Shastri said; "Perhaps due to my being small in size and soft of tongue, people are apt to believe that I am not able to be very firm. Though not physically strong, I think I am internally not so weak."